The new year is a time to set our intention for the coming seasons — to identify and commit to practices that help us make a greater impact in engaging with our life’s purpose and serving others. What’s your goal for the coming year? As a member of our yoga service community, perhaps your vision is to add valuable skills and knowledge to your teaching toolkit in 2016, or to connect with underserved or at-risk populations in your neighborhood to share yoga. If so, Mindful Yoga Therapy program director Suzanne Manafort has an important message for you: there’s never been a better time to make a difference. For many of us, the practices of yoga have changed our lives. That statement may seem dramatic, but it’s true. These practices teach us to turn inward, to pay attention, and to notice without judgment. They enable us to find balance in our bodies and minds, as well as develop our overall well-being. Because of those benefits, yoga is an invaluable asset for Veterans who are coping with trauma-related psychological difficulties. Every day in the United States, an estimated 22 Veterans a day are committing suicide. We want to change that. One way we’re making a difference is through the Mindful Yoga Therapy program, developed to help Veterans to find a calm and steady/mind and continue productive and peaceful lives through the support of the mindful practices of yoga and education. Mindful Yoga Therapy for Veterans is an empirically-informed, clinically tested program comprised of five practices: Pranayama (breathing), Asana (postures connected with breath), Yoga Nidra, Meditation, and Gratitude. Each practice is a tool Veterans can use to cope with Post Traumatic Stress, and together they form a comprehensive system – a toolbox – that will carry Veterans into a life of strength and resilience. Yoga practices are a powerful complement to professional treatment for Post-Traumatic Stress. A mindful, embodied yoga practice can provide relief from symptoms and develop the supportive skills that Veterans need in their everyday lives. Yoga has proven to aid in a Veteran’s healing journey; and we believe that Mindful Yoga Therapy, used in conjunction with psychotherapy, can make a positive impact on the number of veterans we lose each day. Our hopes and aspirations are that we can make a difference. Losing 22 veterans a day to suicide is unacceptable. Please help us to change that. Mindful Yoga Therapy’s next scheduled 100-hour certification training begins in March 2016 in Newington, CT. A limited number of scholarships are available for teachers who are veterans or active duty service members. For more information on scholarships, email connect@mindfulyogatherapy.org. To register for the 100-hour program or view all upcoming Mindful Yoga Therapy trainings, visit the Give Back Yoga Trainings & Events page. Give Back Yoga is honored to partner with the Phoenix Patriot Foundation, an organization that provides direct support to post-9/11 wounded and injured veterans enabling them to fully “Recover, Reintegrate and Remain Engaged” in service to their communities and country. Phoenix Patriot Foundation aids veterans by developing and implementing an individually-tailored program to ensure independence and lifelong sustainability. 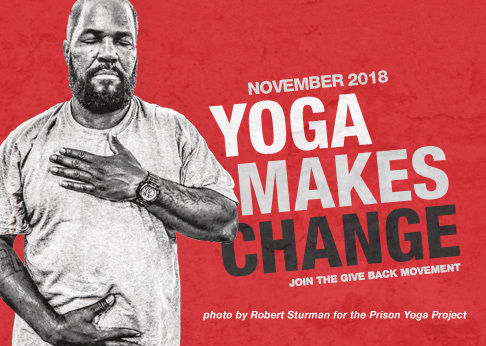 Through the foundation’s Wellness Program, veterans now have access to free Mindful Yoga Therapy and Yoga For Warriors practice guides offered through Give Back Yoga, providing an opportunity to begin experiencing the healing benefits of yoga. Phoenix Patriot Foundation is also co-funding scholarships with Give Back Yoga to help post-9/11 veterans complete a Mindful Yoga Therapy teacher training and share this beneficial practice with their peers. This partnership was established with the help of PPF’s Development Director, Audrey C. Dalton. The daughter of a wounded WWII Purple Heart recipient and the wife of a former Marine who also practices yoga, Audrey shared her thoughts on why wounded warriors can benefit from the tools of yoga. I see a huge need for the Mindful Yoga Therapy toolkit. The trouble veterans often encounter is that they experience post-traumatic stress, and as a result may become deeply depressed. In many cases, veterans who already feel isolated feel as if there is no answer. Many veterans do not even know that options outside of conventional therapy exist. Often they have never tried Yoga, either as a form of exercise or a form of therapy, thinking it either odd or too Eastern, or viewing it as having only a religious connotation. Whether they have limited motion due to injuries or are missing a limb or limbs, veterans may think of Yoga as outside of their scope, even though they are trained warriors. In the past when I taught Yoga classes, many of my students had limited movement and I used adaptive techniques so that they could participate. All veterans can practice Yoga, even if the practice is limited to Yogic breathing techniques. In many instances, the mindset of a warrior only enhances their ability to concentrate. The body is joined with the spirit, and I feel all who come to appreciate Yoga see possibilities, not limitations. Many veterans return from battle without limbs and on drugs prescribed for pain control. When they deployed from the U.S. for combat, some were fresh out of high school with no college or vocational training. When veterans transition back into civilian life, it is as if they have stepped out of a time warp. Technology has advanced light years within the timeframe from when they initially enlisted. Job prospects may exist, but many of the jobs that are available require training or college. Veterans may not have learned how to structure a resumé, and often feel frustration mount as they are faced with few options to pursue as sources of income. The most poignant aspect of all is that these men and women swear an oath to serve, and when they return from duty, the prospects seem grim. Nothing could be further than the truth. These veterans are heroes and Patriots, and we can all learn from their experiences and from their wounds, as tragic as they may be. There is a great depth to all those who travel the road of the military, and there are many good lessons garnered from military experience. Veterans need to see that civilians deeply appreciate their sacrifices. I see Yoga as a saving grace available to all people, and a phenomenal opportunity for veterans to find a way out of darkness and despair. The very definition of Yoga is “to yoke” the union of the spirit or Supreme being with the body. That is what makes it so beautiful, and so powerful. Veterans and servicemembers: request free yoga resources through the Give Back Yoga Foundation. Abuse and traumas in my life drove me to express myself initially as an actress in college, and then professionally. Although successful, I was drawn to dig deeper. Yoga and iRest meditation put me in the trenches, both in my personal work, and in teaching yoga. In my first iRest training, the class consisted of 70 percent veterans and those working with them. The sense of duty and pain were palpable. My father is ex-Navy. I was briefly in civil air patrol as a teen, and later denied enlistment in the Air Force for health reasons. I’ve always been attracted to warriors; yogic texts, like the Bhagavad Gita, flesh out the metaphor of battle. Those stories help us identify personal forms of conflict and resolution. Our nation owes a debt of gratitude to the men and women who have given their time, hearts, minds, and skills to protect our liberties. I am compelled to help them come home, inside and out. It occurred during an iRest training session: a beautiful female veteran stood up, took the microphone, and began to cry. She said that when pressed to find a symbol for her safety, she couldn’t decide between her newborn baby or her weapon. The entire room was quiet. She spoke not only for a soldier’s surreal dilemma, but also for a woman’s place in modern warfare. I’m quite familiar with facing life after trauma. I had not, however, heard the details of these exquisitely personal war stories of the veterans I teach. How can anyone experience war and NOT struggle back home? The rules of engagement for war are based on strategy and staying alive. We watch war movies, the news and other media from the comfort of our couches. It’s neither right, nor wrong. It is simply our present-day reality. But it is startling that we do not seem to have enough resources for our vets’ needs back at home; veterans are very underserved. My experience as a vendor for the VA is that we need smoother, more expeditious systems in place, as well as more providers and diversity of treatments. In a typical studio group class, my approach is based on theme, requests, Ayurvedic assessment, and often the seasons. The cadence and style are light or contemplative, with breath work geared to philosophical and spiritual growth. In private sessions and veteran groups, I use a structured approach for sense of success and familiarity. iRest has a protocol, but each session shifts its inquiry within the framework. Some deconditioning is the result of this slower-paced journey; that can be uncomfortable. Calming breathing techniques, grounded poses, lifestyle choices and applied yoga psychology are part of the work we do together. Personal agenda is a sneaky creature. It pops up right when a client is having an insight and finding words to express it. Through the years, the greatest moments of healing come from my listening and presenting the work while I remain somewhat invisible. The challenge is to keep things simple, easy to take home and to duplicate, to not overload too much information. There is such a wealth of text out there with incredible philosophical content that can radically alter outlook. But we can only digest a little at a time; it takes a while to feel the difference. That “felt sense” (iRest vernacular) is the catalyst for change. Do it! This is an amazing group of people. Enroll in specific training and procure professional mentorship of those who are already doing the work. Seek advice from western and eastern medical fields, and nurture those relationships. Stay optimistic when a group series yields attrition; we can’t know what kinds of struggles keep our vets from regularly attending sessions. Keep the pacing slower, the language easily digestible, and intuit when to shift the class or session plan. Cultivate the skill of synthesizing yoga philosophy with other cultural and religious belief systems. Finally, develop strong personal and professional boundaries. This will elicit respect and reverence for all involved. The wounds of our veterans permeate all realms: physical, psychological, and spiritual. Posted on The Huffington Post, January 10, 2014, “veterans make up nearly 10 percent of the U.S. population, they account for roughly one in five suicides, according to an analysis conducted by News21, an investigative student journalism initiative, CNN reported in September.” Their needs are immediate. Yet our nation struggles to allocate resources. Implementing more models in which non-VA care providers network and advertise directly to this population would be advantageous for all involved. Websites that categorize grant-funded, nominally- and competitively-priced services would facilitate greater access to more care. Our imperative is to assist these brave men and women with re-integration into the very culture they have fought hard to protect. Training for war is intensive. Training to return to their home lives is crucial. Needs are dynamic in the continuum of healing, and iRest and yoga therapy are flexible approaches that can serve anyone on that continuum. This is important, because healing doesn’t occur in a linear fashion. Service here is now defined by an explorative quality of being with, rather than “dealing” with, a condition. Classical definitions of yoga practice from my early years had markers of progress. Now, charting those markers has become less concrete. There is a soulful artistry in allowing pain, joy, confusion, loss, and success move through our open hands like water. Nothing here is permanent. This realization has fostered deeper appreciation for me. I am in each soldier’s story. My personal practice more deeply honors the chaotic and the mundane for the gifts they bring. My teen children need me to just do nothing with them sometimes, to listen to them talk of friends and new shoes. I am also compelled to listen to the pain a vet shares when remembering unimaginable destruction. Those relationships are the union to which the definition of yoga refers. That is the practice now. I listen, breathe, and feel the sacredness of it all. Help us to expand awareness about the healing powers of yoga: learn how you can become a Warrior for Healing by participating in our upcoming event and crowdfunding campaign. Our 100 hour Embodyoga®-based training for yoga teachers provides an in-depth study and certification. Our next 100-hour certification session begins January 2016 in Newington, CT. To be notified of new training dates, scholarship opportunities and program updates, join the Mindful Yoga Therapy mailing list. Military Spouses: Studio Bamboo is registered with the MyCAA program, which provides partial or full tuition for Career Advancement programs for military spouses. For more information, contact Studio Bamboo Yoga. Veterans and Active Duty Servicemembers: Mindful Yoga Therapy has received a grant from The Sampson Foundation to fund scholarships that will help veterans and active duty servicemembers to attend any upcoming Mindful Yoga Therapy training. For more information, email Mindful Yoga Therapy at connect@mindfulyogatherapy.org.